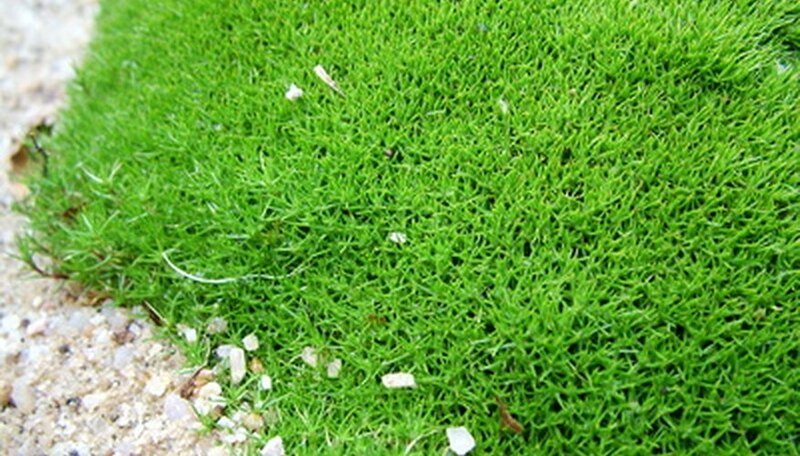 Irish moss (Sagina) is a green ground cover with tiny white flowers in late spring. Easily reminiscent of an Irish landscape in miniature, it lends a healthy hue to the garden as it spreads between rocks and steppingstones. It is not actually a moss, says an article by Cheryll Greenwood Kinsley of Washington State University, and, indeed, it's not always referred to as one. The USDA lists other common names, such as pearlwort and Corsican pearlwort. One species of Irish moss is commonly available along with its hybrid, the yellow-green Scotch moss (Sagina subulata Aurea). There are other species of sagina found in the wild that do not have ornamental use. Of the 11 species on the USDA's plant database, three are annual, four are perennial, two are biennial and two are unknown. All but three are native to some part of North America. The Irish moss in our gardens comes from Europe. Irish moss and Scotch moss are hardy in USDA plant hardiness zones 3 to 7. Arctic pearlwort (Sagina saginoides) grows as far north as Greenland and south to California, showing how adaptable the genus can be. Cheryll Greenwood Kinsley writes that Irish moss is native to Scotland and that the Latin meaning for Sagina Is "fattening," perhaps so named because the sheep did so well in fields where Irish moss grew. Irish moss spreads in soft mounds and will fill in steadily if an area is to its liking. The flowers dot the foliage in May and June. Scotch moss isn't quite so sturdy, but will fill in as well. The wild pearlwort varieties seem to have a looser creeping habit and some have larger white flowers, but all species appear moss-like. According to eFloras, many, such as the wild version of Irish moss, grow in "wet, gravelliy sands" next to streams or on roadsides. Irish and Scotch moss can grow in full sun with adequate water. In full shade, they will not have a profusion of flowers. Morning sun is best. Both varieties hate to dry out, but if this happens, water will revive them in most cases. Plant in a well-drained soil with some compost. Cheryll Greenwood Kinsley recommends using a slow-release fertilizer in spring. Propagate by division, which involves separating sections of the root mat. Irish and, to a lesser extent, Scotch moss can have invasive tendencies. Then again, some gardeners can't grow the plants at all. If you find them in places where you didn't plant them or want them, you may describe them as invasive. Irish moss propagates itself more easily than Scotch; it reseeds itself readily. Fortunately or unfortunately, plants will choose the best areas for their purposes.